Republican VP candidate Paul Ryan and former Secretary of State Condoleezza Rice made a surprise stop at the Cleveland Browns headquarters today. Former Secretary of State Condoleezza Rice and Republican vice presidential candidate Paul Ryan made a surprise visit to Cleveland Browns headquarters Wednesday afternoon. The two VIP’s were part of a 10 car motorcade that arrived in Berea shortly before 1 p.m. Rice and Ryan were just down the road at Baldwin Wallace University earlier in the day stumping for Mitt Romney, where Rice told voters the last four years have been tough on working folks. The two were escorted out onto the Browns practice field along with a 30-40 person press core. 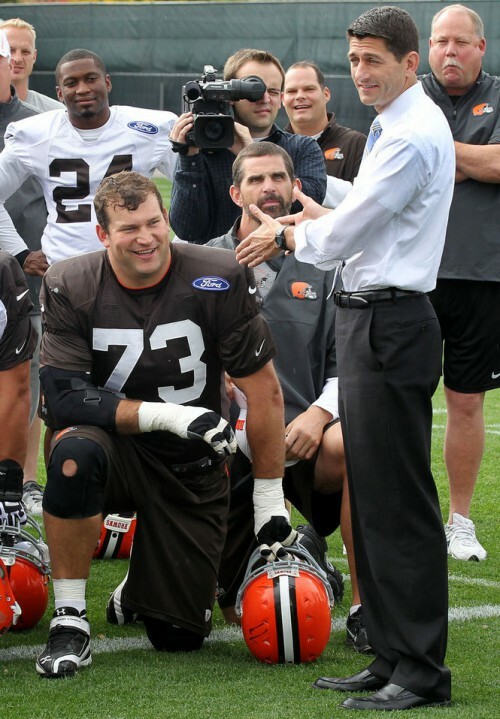 Rice, an admitted Browns fan, got to meet her favorite player, Joe Thomas, and address the football team briefly. A warm applause from the players who were gathered around them on one knee.